Trying a protein supplement with ProHydrolase can work wonders – this ingredient can ramp up amino acid levels in the blood and improve protein bioavailability considerably. One such supplement is KAGED MUSCLE MICROPURE Whey Protein Isolate. Get ready, because Kris Gethin’s new product will blow you away, as you’ll find out in this review. Twenty-five grams of MICROPURE WPI per serving . Gives you a solid 50 percent of the daily value for protein. ProHydrolase technology. Improves protein absorption and increases amino acid levels in the blood. Incredible taste. Far and away one of the best-tasting protein supplements on the market. Ingredients: Whey Protein Isolate, Cocoa Processed with Alkali, Natural Flavors, Sunflower Lecithin, ProHydrolase®, Stevia rebaudiana Leaf Extract, Sea Salt, Sucralose. Directions: Mix 1 scoop with about 5 to 8 ounces (150 ml – 240 ml) of cold water or your favorite beverage. Consume before or after your workouts or anytime you desire a high-quality, high-protein drink. Former Bodybuilding.com Editor-in-Chief and current KAGED MUSCLE CEO Kris Gethin has earned a stellar reputation from many bodybuilding enthusiasts. His top-notch products speak for themselves. Take, for example, his post-workout supplement KAGED MUSCLE RE-KAGED. Its awesome ingredient combo of 28 grams of whey protein isolate, three grams of l-glutamine, 1.5 grams of betaine anhydrous, and 1.5 grams of creatine hydrochloride per serving blew us away. If you add this to your supplement stack and you will see major gains from here on out. We also gave Gethin’s signature BCAA supplement, KAGED MUSCLE BCAA 2:1:1, high marks. You can’t go wrong with fast-absorbing fermented BCAAs. These are sure to help you remain in an anabolic state in and out of the gym. KAGED MUSCLE MICROPURE Whey Protein Isolate can help you achieve your lean-muscle-building goals. We’re hoping Gethin and Co. maintain their momentum with their latest protein powder, KAGED MUSCLE MICROPURE Whey Protein Isolate. The manufacturer calls it its “MICROPURE Whey Protein Isolate With ProHydrolase Enzyme Technology,” per its official website. “A new generation of whey protein isolate offering superior quality, enhanced functionality, and maximum performance has arrived. KAGED MUSCLE’s MICROPURE Whey Protein has been formulated to be the purest, cleanest, and fastest-digesting whey protein isolate on the market. With zero fillers, no amino spiking, protein blends or concentrates, less than one gram of sugars, fats, and minimal carbs; and no added dyes or colors – bodybuilders and other athletes can accelerate recovery and maximize gains in size and strength, without compromise,” per the same source. The likes of Muscle Feast Hormone-Free Grass-Fed Whey Isolate have dominated online supplement rankings. However, this particular product’s luster has faded (its protein content dwindled from 24 grams to 20.5 grams per scoop). A new protein supplement such as KAGED MUSCLE MICROPURE Whey Protein Isolate can pounce on this opportunity. Not only can it make a good first impression, but it can also serve notice to customers it’s one of the best protein supplements on the market today. This puts KAGED MUSCLE MICROPURE Whey Protein Isolate in elite company. We’re confident this much will increase muscle protein synthesis (MPS), shorten recovery time, fill nutrition gaps, and meet your daily protein requirements. KAGED MUSCLE CEO Kris Gethin prefers whey protein isolate (WPI) over whey protein concentrate (WPC). “Whey protein isolate not only serves up more quality protein per scoop to ignite muscle protein synthesis, it’s also lower in unwanted lactose, fat, and carbohydrates than cheaper protein sources. It’s typically more expensive to manufacture, due to the advanced methods of processing it undergoes,” per KAGED MUSCLE’s official website. “The whey protein in MICROPURE Whey Protein Isolate has been filtered using the most advanced cross flow micro- and ultrafiltration technology to minimize fat, cholesterol, lactose and other impurities, for an ultra-pure, non-denatured isolate protein. The result is a superior-quality, rapid-absorbing whey isolate that yields the perfect amino acid profile to fuel your body’s anabolic machinery,” per the same source. “Whey protein is an important nutrient supplement for muscle-building applications with resistance training. In the current study, we found that whey protein can also play roles of physiological protection and performanc elevation with various types of aerobic exercise,” per the June 22, 2017 issue of International Journal of Medical Sciences (via NCBI.NLM.NIH.gov). For more information, you can check out B5’s Best Protein Powder For Runners. WPI is the purer from of protein (approximately 90 to 95 percent) compared to WPC (roughly 70 to 85 percent). The manufacturer correctly points out the former has less, fats, lactose, and carbs than its WPC counterpart. Ergo, a WPI supplement such as KAGED MUSCLE MICROPURE Whey Protein Isolate should support your lean-muscle-building goals. The body cannot synthesize essential amino acids (EAAs). Because of that, one must obtain them from whole foods or supplements. Branched-chain amino acids (BCAAs) are EAAs which help increase MPS, fat loss, and endurance; keep muscle soreness at bay, preserve muscle mass, and regulate blood sugar levels. KAGED MUSCLE MICROPURE Whey Protein Isolate has a solid 5.5 grams of BCAAs per serving. It trumps the likes of Muscle Feast Hormone-Free Grass-Fed Whey Isolate (which has 4.6 grams of BCAAs per serving). That’s making a resounding statement, if you ask us. As for KAGED MUSCLE MICROPURE Whey Protein Isolate’s conditionally-essential (4.9 grams per scoop) and non-essential (8.3 grams per scoop) content is high for a protein supplement. We’re certain your body will reap enormous benefits. Among the most popular conditionally-essential amino acids (CAAs) are l-arginine (a nitric oxide booster and vasodilator which you can find in many pre-workout supplements) and l-glutamine (the most abundant amino acid which help preserve muscle mass and increase human growth hormone (HGH) levels which you can find in many post-workout supplements). 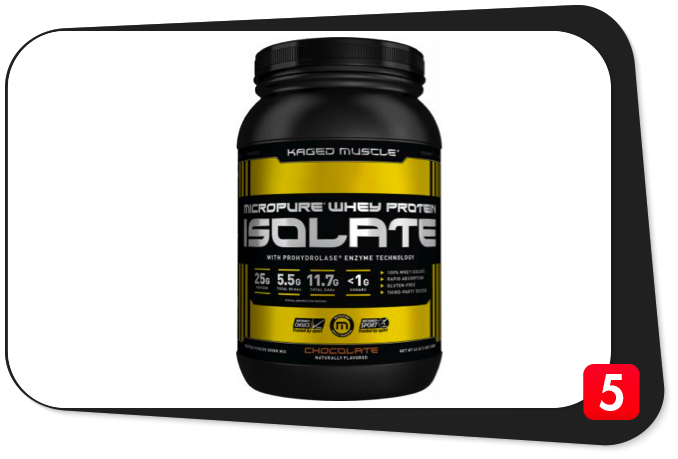 We’re stoked KAGED MUSCLE MICROPURE Whey Protein Isolate has an ample supply of CAAs. It gets better: this product has 250 milligrams of ProHydrolase per serving. This is “a bio-efficient supplement designed to build muscle mass and accelerate muscle recovery when used as an ingredient in protein supplements or meal replacements,” per Deerland Enzymes’ (the manufacturer of ProHydrolase) official website. Long story short, this ingredient helps improve protein absorption for increased muscle mass and better overall results. “ProHydrolase rapidly breaks down the whey protein isolate into highly-bioavailable micro fractions, allowing your body (t0) easily absorb the protein and take full advantage of the available essential amino acids for building muscle and maximizing recovery. 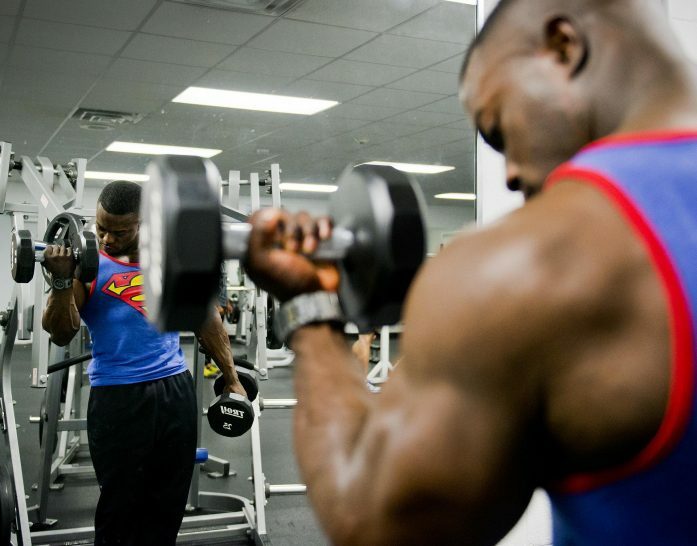 With more amino acids hitting your bloodstream, the greater the protein synthesis response to accelerate your gains,” per KAGED MUSCLE’s official website. We love the inclusion of 250 milligrams of ProHydrolase in KAGED MUSCLE MICROPURE Whey Protein Isolate. Only a handful of protein supplements have this component. It’s not uncommon to see one with black fruit pepper extract (BioPerine) to improve nutrient digestion. ProHydrolase takes things to a different level. 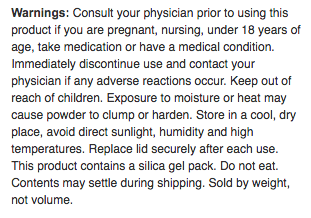 We hope other bodybuilding supplement manufacturers follow suit. Our first impression: KAGED MUSCLE MICROPURE Whey Protein Isolate is a top-notch protein supplement which should exceed your expectations. The formulation is spot on. Gethin and Co. also don’t go overboard on the other components such as fats, cholesterol, and sodium. It’s a great addition any bodybuilding supplement stack. Calories, 120: KAGED MUSCLE MICROPURE Whey Protein Isolate has 120 calories per 32.7-gram scoop. Most protein supplements on the market have around 100 to 150 calories per serving. That means this product is right on the industry average. Calories from fat, 10: The manufacturer whittles down KAGED MUSCLE MICROPURE Whey Protein Isolate’s fat content to a measly 10 calories per scoop. Total fat, 1 g: KAGED MUSCLE MICROPURE Whey Protein Isolate’s fat content represents a measly two percent of the daily value (a maximum daily value of five percent is low). Saturated fat, 0.5 g: This supplement has a scant three percent of the daily value for saturated fat, which is good. The American Heart Association encourages the general public to monitor its saturated fat intake for good long-term cardiovascular function. Trans fat, 0 g: KAGED MUSCLE MICROPURE Whey Protein Isolate has no trans fat content whatsoever. Trans fats raise bad cholesterol (LDL) levels and lower good cholesterol (HDL) levels. This may cause cardiovascular issues in the long run. Cholesterol, 15 mg: This supplement keeps its cholesterol levels in check at just five percent of the daily value. High cholesterol levels may also result in cardiovascular issues, per the American Heart Association’s official website. Fortunately, KAGED MUSCLE MICROPURE Whey Protein Isolate’s low cholesterol levels support a healthy heart. Sodium, 90 mg: While sodium helps maintain proper fluid balance, increase hydration, and ward off muscle cramping, too much may compromise blood pressure levels. KAGED MUSCLE MICROPURE Whey Protein Isolate’s measly four percent of the daily value for sodium is safe for individuals who are monitoring their salt intake. Potassium, 210 mg: KAGED MUSCLE MICROPURE Whey Protein Isolate is not really a significant source of potassium at just six percent of the daily value. Total carbohydrate, 3 g: KAGED MUSCLE MICROPURE Whey Protein Isolate is a classic example of a WPI supplement with low carb content at a paltry one percent of the daily value. That much should complement your low-carb nutrition plan perfectly. Dietary fiber, <1 g: KAGED MUSCLE MICROPURE Whey Protein Isolate isn’t a significant source of dietary fiber at just four percent of the daily value. Sugars, <1 g: Gethin and Co. keep this protein supplement’s sugar levels to a bare minimum at less than one gram per scoop. Protein, 25 g: KAGED MUSCLE MICROPURE Whey Protein Isolate is a tremendous source of protein at an impressive 50 percent of the daily value. This much should help you increase muscle mass, meet your daily protein requirements, shorten exercise recovery time, and fill nutrition gaps. Vitamin A, 0 percent DV: KAGED MUSCLE MICROPURE Whey Protein Isolate has no vitamin A content whatsoever. Vitamin C, 0 percent DV: KAGED MUSCLE MICROPURE Whey Protein Isolate has no vitamin C content whatsoever. Calcium, eight percent DV: KAGED MUSCLE MICROPURE Whey Protein Isolate has moderate calcium content at eight percent of the daily value. This mineral helps strengthen bones, regulate blood pressure levels, and boost cardiovascular function. Iron, four percent DV: KAGED MUSCLE MICROPURE Whey Protein Isolate is not a significant source of iron at a measly four percent of the daily value. The manufacturer dubbed KAGED MUSCLE MICROPURE Whey Protein Isolate the “MICROPURE Whey Protein With ProHydrolase Enzyme Technology,” per its official website. That alone should tell you this protein supplement has a unique identity. In fact, we daresay it’s one of the top-notch WPI supplements on the market today. First off, you have 25 grams of MICROPURE whey protein isolate per 32.-7 gram scoop. That gives you a solid 50 percent of the daily value for protein – a sure bet to increase muscle mass and shorten recovery time in conjunction with regular training and sound nutrition. Plus, that much should also help you meet your daily protein requirements and fill those nutrition gaps. You’re also talking about MICROPURE whey protein isolate content, a kind of WPI which keeps fats (two percent of the daily value), carbs (one percent of the daily value), and cholesterol (five percent of the daily value) to a bare minimum. Granted, the likes of Muscle Feast Hormone-Free Grass-Fed Whey Isolate have lower fat, cholesterol, and carb content (which all represent an astonishing zero percent of the daily value), but KAGED MUSCLE MICROPURE Whey Protein Isolate is no slouch, for sure. Let’s not forget this supplement’s protein content boasts of impressive essential amino acid (11.7 grams), branched-chain amino acid (5.5 grams), conditionally-essential amino acid (4.9 grams), and non-essential amino acid (8.3 grams) content per serving. We’re talking about sky-high numbers here. Other WPI supplements can’t keep up. KAGED MUSCLE MICROPURE Whey Protein Isolate’s 250 milligrams of ProHydrolase per scoop also set itself apart from the pretenders. Not only will this component improve nutrient absorption, but it will also increase amino acid levels in the blood and ward off inflammation. These are tremendous bonuses, if you ask us. We also didn’t find any ingredient in KAGED MUSCLE MICROPURE Whey Protein Isolate which goes overboard. Not including the protein content, the other components have a daily value of no more than six percent. It would’ve been great if the manufacturer increased the calcium and potassium levels, but we’ll take it. Believe it or not, some protein supplements have high cholesterol levels (an example is Bodybuilding.com Signature 100% Whey Protein, which has 15 percent of the daily value for cholesterol). We’re relieved KAGED MUSCLE MICROPURE Whey Protein Isolate doesn’t. Gethin and Co. also do a great job in terms of transparency – they reveal all of the ingredient amounts. You won’t find any shady proprietary blends in KAGED MUSCLE MICROPURE Whey Protein Isolate. This protein supplement has also made a big splash among customers. They say both the Chocolate and Vanilla flavors please their taste buds to no end. We agree wholeheartedly. KAGED MUSCLE MICROPURE Whey Protein Isolate is right up there with the likes of Quest Protein Powder as among the tastiest in this product category. Just about the only chink in this product’s armor is the inclusion of sucralose, an artificial sweetener which has ties to obesity. While the inclusion of stevia (a natural alternative which helps regulate blood pressure and blood sugar levels) was awesome, it would’ve been better if the manufacturer left out the sucralose content completely. Nevertheless, KAGED MUSCLE MICROPURE Whey Protein Isolate has made a resounding statement: it’s one of the best WPI supplements in the bodybuilding supplement industry today. Buy it and reap its incredible benefits today. We agree with most of these claims. We won’t be surprised if KAGED MUSCLE MICROPURE Whey Protein Isolate makes it to the leaderboard of online protein supplement rankings sooner than later. The manufacturer intended KAGED MUSCLE MICROPURE Whey Protein Isolate for healthy and active individuals who are at least 18 years of age who want to increase muscle mass, shorten exercise recovery time, meet their daily protein requirements, fill nutrition gaps, and achieve their daily fitness goals. KAGED MUSCLE MICROPURE Whey Protein Isolate has sucralose, an artificial sweetener which has links to obesity and the like. If this, or any other ingredient, makes you feel doubtful, please consult your doctor before buying KAGED MUSCLE MICROPURE Whey Protein Isolate. Twenty-five grams of WPI per serving. Represents a solid 50 percent of the daily value. MICROPURE protein content. Fast-absorbing WPI which keeps fats, cholesterol, and carbs to a minimum. Impressive EAA, BCAA, CAA, and NAA content. Higher than your average protein supplement. ProHydrolyase technology. Ensures better protein bioavailability and increased amino acid levels in the blood. Awesome taste. One of the best-tasting WPI supplements on the market. Flavor options. Comes in delicious Chocolate and Vanilla flavors. Sucralose inclusion. Artificial sweetener with links to obesity. Some whey protein isolate supplements’ (most notably Muscle Feast Hormone-Free Grass-Fed Whey Isolate) value for money has plummeted in recent past. With the emergence of new players such as KAGED MUSCLE MICROPURE Whey Protein Isolate, there’s bound to be another major shakeup among protein supplements. KAGED MUSCLE MICROPURE Whey Protein Isolate not only meets expectations, but it exceeds them. This is one WPI supplement you must include in your bodybuilding supplement stack for the foreseeable future.